Abstract: It is explained why lasers can have a low pump threshold power even if the gain medium has a very short upper-state lifetime. A reader has drawn my attention to the following observation, which surprised him. A short upper-state lifetime of a laser gain medium raises the threshold pump power. 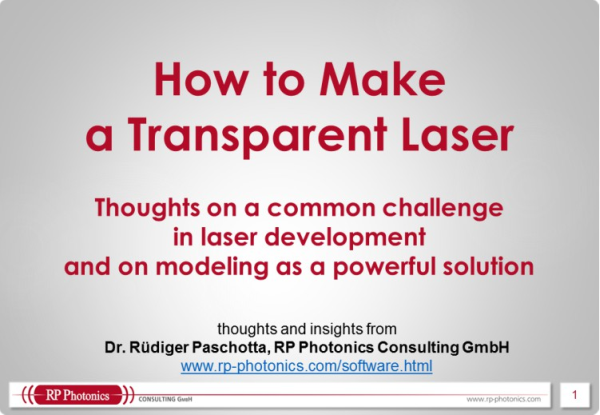 How is it then possible that some lasers – for example, semiconductor lasers – can easily reach threshold despite a very small upper-state lifetime of only a few nanoseconds? The answer is that the threshold pump power is determined by the gain efficiency (essentially, the gain per unit pump power), and the gain efficiency is strongly related to the product of two factors: the upper-state lifetime and the emission cross section. (That product is also called the σ−τ product.) The laser threshold can be low despite a low upper-state lifetime, if the emission cross section is large. In that situation, it is not possible to obtain a high density of excited electrons (at least with continuous pumping), but each excited electron contributes a lot to the laser gain. In principle, an extremely low laser threshold would result from the combination of a high emission cross section with a long upper-state lifetime. There are limits to that, however. Essentially, the product of emission cross section and emission bandwidth (gain bandwidth) determines the rate of spontaneous emission, and this sets a limit for the upper-state lifetime. So we see that a narrow gain bandwidth is a necessary (but of course not sufficient) condition for a high σ–τ product and thus a high gain efficiency. The situation is different for pulsed pumping. When a laser is pumped with pulses, the duration of which is well below the upper-state lifetime, spontaneous emission is not very relevant for the threshold. In that case, the emission cross section rather than the σ-τ product is what counts. So the lowest threshold for pulsed pumping is obtained with a gain medium having high cross sections, and thus generally a lower upper-state lifetime.